Arabia in the seventh century AD was a harsh place to live, with no established state and no rule of law, outside the governance of the Byzantine and Sassanid empires to the north. It was home to a tribal society, full of internecine conflict, with a polytheistic religion followed in the settled areas, and with Mecca serving as a centre of one of these pagan cults. 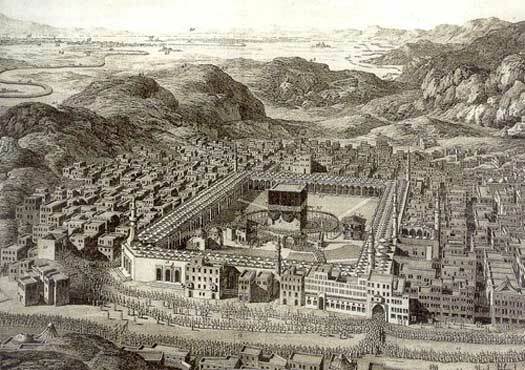 Despite its obvious later importance, the history of Mecca as an important early centre may have been played up somewhat in order to increase its significance, as some scholars think that it was a relatively minor settlement prior to the advent of the Islamic empire. Muhammad is believed to have been born in Mecca around 570, a member of one of the prominent tribes there, but not a member of the ruling elite itself. The exact location of his birth is unknown and no marker or memorial exists, primarily so that the attention of the faithful is not drawn away from the worship of God. Muhammad was an orphan by the age of six. Taken in by other members of his clan, he became a successful, married trader, reaching the upper echelons of society. According to tradition he found this lifestyle to be unsatisfactory and, at the age of forty, he underwent a dramatic revelation that changed his world view. He began preaching this revelation in Mecca and, despite opposition by the ruling Quraysh and later suggestions that he was operating purely on a political basis, he won converts. His first wife, Kadijha, a trader who was older than Muhammad, could be claimed as the first Muslim, as she believed his revelations even before he did. Failing to make headway with his ideas in Mecca, Muhammad fled the city with his converts, heading for the oasis settlement of Yathrib (later known as Medina), and narrowly avoiding an assassination attempt in the process. The band that he took with him, and the converts he made at Medina, went beyond kinship or tribal allegiances and was instead based on ideology, something that was entirely new in Arabia. The year was AD 622, and the event was the Hijrah (or Hijra), the 'cutting off from the past'. A new age had begun in Arabia. Hijrah began on 16 July 622. Died 7 June in Medina. Some of the pagan tribes and the Jewish tribes that have long been based at Medina have grown resentful of Muhammad's growing power and his determination to impose his Constitution of Medina upon them. They are also concerned with Muslim attempts to destroy Meccan trade, which forms a major source of income for many tribes, perhaps especially the Jewish ones. Now the Banu Qaynuqa, one of the three main Jewish tribes at Medina, are banished from Medina, allegedly for conspiring with Muhammad's enemies at Mecca. The fact that they are banished rather than executed suggests that Muhammad still hopes for a reconciliation. Soon afterwards, Mecca sends a much greater force to avenge the defeat of 624. The result of the Battle of Uhud is a draw. The Meccans return with an army of 10,000 warriors to face Muhammad's 3,000. There is no question of giving the vast Meccan force battle, so Muhammad retreats into Medina to offer a siege, known as the Battle of the Trench, after the well-dug defensive work in front of Medina. The siege collapses within a couple of months due to a lack of supplies and equipment, but just after the Meccan forces leave, one of the remaining Jewish tribes is accused of holding negotiations with them. Muhammad, now the powerful if modest ruler of Medina, declines to be involved in what happens next. An important moment is marked when Muhammad wins unstated but unambiguous recognition from the Quraysh that he and they are equals. He announces that he is going on Hajj, a pilgrimage to Mecca, which must be undertaken without weapons. He and his followers are stopped by Quraysh cavalry about thirteen kilometres (eight miles) from Mecca. There, through negotiation with the Quraysh, Muhammed wins acknowledgement that he can return the following year providing he gives up raiding Meccan trade caravans and drops his title (these terms supply the so-called Treaty of Hudaibiya). He views this apparent climb-down as a worthy price to pay for peace today and the chance of making fresh converts and alliances against the Quraysh tomorrow. Following the treaty, he attacks the Jewish Khaybar oasis in the Battle of Khaybar, possibly because the Banu Nadir are there, busy inciting hostilities against him. Muhammad is able to quickly put together a huge army that marches on Mecca. The Quraysh, suddenly heavily outnumbered, are in no position to do anything but surrender, their power broken. Muhammad forgives them, declaring an amnesty for all but ten individuals (some of whom are also later pardoned). Most of the inhabitants of Mecca convert to Islam voluntarily, without it being imposed, and the pagan idols in and around the Kaaba are destroyed. With this peaceful 'conquest' the Arab tribes becomes followers in droves. Muhammad returns to Medina and, within a year, he is master of all of Arabia. The Rightly Guided Caliphs were Muhammad's companions, or 'sahaba', although the concept was only established by the later Abbasids. The Islamic caliphate was created based on the idea that the caliph was the direct successor to Muhammad's political authority, and each caliph was chosen either by his predecessor before death, or by a council. Upon the death of Muhammad, it was Abu Bakr who calmed his distraught converts. Soon afterwards, a gathering at Medina of the most important figures in early Islam selected Abu Bakr, Muhammad's close companion, as his successor. The city itself was selected as the growing empire's first capital. Another of the companions was Amr Ibn Al-Aas, the military commander who was responsible for the conquest of Egypt. Abu Bakr's accession triggers the Ridda Wars, or Wars of Apostasy, when several Arabic tribes, including Christian Arabs in Jordan, and other Arabs in Arabia, Oman, and Yemen, refuse to fully observe strict Muslim practises. Abu Bakr's campaigning defeats all of them, establishing Islamic rule over all of Arabia, including tribes such as the Kedarites. Following this he sends armies towards Byzantine Syria and Sassanid Iraq. It is under the leadership of Umar that Islam begins its rapid expansion outside Arabia. Eastern Roman Emperor Heraclius is defeated, and Palestine and Phoenicia are conquered in 636 and 637 respectively. Mesopotamia is conquered from the Persians in 637, and Jerusalem falls in 638. Roman Syria, Egypt and Libya are taken in 638-640, and the Persians themselves are defeated in 642. Following Umar's murder, a council of electors nominates Uthman as his successor. Of the Umayyad Clan. Murdered. Expansion continues under Uthman. The Georgian kingdom of Iberia is taken in 645, inroads are made in Tunisia from 647, and the Sassanids are overrun by 651, along with Khorasan, where an Islamic emirate is formed to govern this rather wild region. Former Kushanshah territory in what later becomes Afghanistan is taken in 652, although Kabul and Zabulistan manage to hold out for quite some time - two centuries! Attempted invasions of the kingdom of Dongola and the island of Sicily are repulsed in the same year. However, Uthman's style of leadership is perceived by some as being too much like that of a king, and he is murdered. Ali takes command, although he is not fully accepted by the governors of Egypt. The growing empire begins to threaten Armenia. Aided by the Byzantines, Armenia defends itself, but the Arab campaign continues northwards into the Caucuses under General Salman. He concentrates on the towns and settlements of the western coast of the Caspian Sea and on defeating the Khazars. A description of this campaign is based on a manuscript by Ahmed-bin-Azami, and it mentions that '...Salman reached the Khazar town of Burgur... He continued and finally reached Bilkhar, which was not a Khazar possession, and camped with his army near that town, on rich meadows intersected by a large river'. This is why several historians connect the town with the proto-Bulgarians. The Arab missionary Ahmed ibn-Fadlan also confirms this connection, as he mentions that during his trip to the Volga Bulgars in 922 he sees a group of 5,000 Barandzhars (balandzhars) who had migrated a long time ago to Volga Bulgaria. He also encounters a group of people who may tentatively be identified with the Venedi. Son-in-law & cousin of Muhammad. Assassinated. Ali is the second historical follower of Islam. Some Muslims see him as one of several possible leaders while others believe him to be divine. The Sunni/Shia split in Islam is created by his rule, with Sunni Muslims counting Abu Bakr as the first legitimate Caliph, while the Shi'a count Ali as the first truly legitimate Caliph. For two decades around these years the First Islamic Civil War rages in Arabia, and Ali is assassinated in 661. Hasan is appointed as his successor. Hasan, regarded as a righteous ruler by Sunni Muslims, is recognised by only half the Islamic empire. He is challenged and ultimately defeated by Mu'awiya, the Umayyad governor of Syria. The governor of Islamic Syria, Mu'awiya, was one of the main challengers against Hasan ibn Ali during the First Islamic Civil War. He claimed descent from an ancestor who was common to both him and the Prophet Muhammad, although their clans within the encompassing Quraish tribe were different. After he had overcome Ali and the other claimants he founded the Umayyad dynasty, named after his great-grandfather, Umayya ibn Abd Shams, and made the position of caliph an hereditary one. The capital was established at Damascus just over a decade after the dynasty was founded. The rival Hashemite clan of the Quraish tribe was granted the emirate of Mecca in the tenth century. First Sufyanid caliph. Won the caliphate from Ali. Rebel who refused to drop his allegiance to Ali. Killed. A foothold is established in what becomes Islamic Ifriqiyya and the Maghreb. In 667 the empire snatches control of further parts of the region from Byzantium's Carthage, and launches raids further west. Oqba ibn Nafi'i establishes a base of operations at Kairouan in 670 and begins the erection of the Great Mosque, generally thought to be the oldest sanctuary in the western section of the Islamic empire. The capital moves to Damascus in Syria and an Arab aristocratic government is established there. The empire also besieges Constantinople. Following the death of Mu'awiya, his son Yazid kills his own rival for the caliphate, Hussein, at Karbala. Hussein's martyrdom makes the city holy to Shiites. Abd-Allah ibn al-Zubayr, his fellow opponent to Yazid, survives and continues his opposition, becoming a recognised claimant to the caliphate in 683. Son of Ali. Rival for the caliphate. Killed by Yazid. Grandson of Abu Bakr through his mother. Killed in battle. Son of Mu'awiya. Governor of Syria. Byzantine territory in Morocco falls to the Islamic empire. Son. Last Sufyanid caliph. Governor of Syria. Umayyad from a different branch. Governor of Syria. Abd al Malik's accession sparks another rebellion which takes form under Al-Mukhtar. A battle at Kufa in the following year ends the rebellion when Al-Mukhtar is killed. Son of one of the first Islamic warriors to be killed. 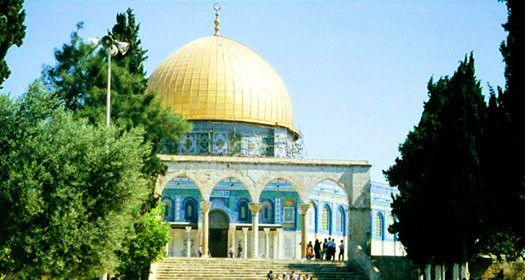 In the same year as Iraq is brought fully back under Umayyad control, the Dome of the Rock is completed in Jerusalem, on the site of the former Jewish Second Temple (destroyed during the Roman siege of Jerusalem in AD 70). It survives to this day, making it the oldest existing Islamic building in the world, and probably the holiest. Abd al Malik spends his first years reconsolidating Umayyad control of the empire after the civil war, but in 698 he turns his attentions towards expansion. By 703 the Byzantine North African territories in Algeria and Tunisia have fallen to the Islamic empire. Armenia falls to the Islamic empire. The Umayyad general, Muhammad bin Qasim, sails to Sindh in India and conquers both that and Punjab (in modern Pakistan), marking major conquests for the caliphate. In 711, Visigothic Spain falls, signalling the end of the Visigoths as a coherent entity. The Arabs also build the Umayyad mosque in Damascus in Syria. During Sulayman's reign, Byzantine Constantinople is placed under protracted siege, but it fails in 718, marking the end of any serious ambitions to conquer the Byzantine empire. The following year in the Islamic emirate of Khorasan, the Abbasids begin to seek followers to their cause of removing their sworn enemies, the Umayyad caliphs, from power. They also target the supporters of the failed rebellion by al-Mukhtar in 686. Alania is invaded by the troops of Umar II. In 722, the Khazars come to their aid under a chieftain called Barjik. Together, the two peoples push out the Muslims, and the Khazars subsequently erect several strongholds in the region. Son of Abd al Malik. Governor of Syria. Shortly after his accession, Yazid II is faced with a major rebellion in Iraq by the recently recalled governor of the Islamic emirate of Khorasan, Yazid ibn al-Muhallab. After being imprisoned briefly by Umar II, the governor refuses to swear allegiance to Yazid II. Raising an army of his own, he dies in battle against Yazid II. Rebel governor of Islamic emirate of Khorasan. The Islamic army in Spain suffers a major defeat at the hands of Odo, duke of Aquitaine, at the Battle of Toulouse. Brother of Yazid II. Grandfather of the first Umayyad amir of Spain. Despite being a successful governor of Egypt, Handhala ibn Safwan al-Kalbi is replaced when Hisham succeeds in Damascus. The new caliph sends his own brother, Muhammad ibn Abd al-Malik ibn Marwan, to govern Egypt. A Muslim general penetrates the Gate of the Alani and devastates the region of the North Caucuses. The Frankish mayor of the palace, Charles Martel, defeats an army of 90,000 Arabs at Tours in France, ending the northwards expansion of the empire through Spain and into southern France. In fact, under Hisham, expansion is generally restrained. Instead, he establishes court at Resafa in northern Syria, and resumes Islamic attacks on the Byzantine empire. Again, the Islamic empire sends a force into Alania which manages to devastate the forts there. Son of Yazid II. Governor of Syria. Killed. Yazid III is a son of al-Walid I. He is proclaimed caliph in Damascus, and his army closes in on al-Walid II and kills him, securing the caliphate for Yazid III. Unfortunately, Yazid III himself dies after just six months as caliph. Son of al-Walid I. Governor of Syria. Brother. Deposed. Governor of Syria. Ibrahim is Yazid III's nominated successor, but Marwan marches an army to Damascus where he is proclaimed caliph in December. He immediately moves the capital to the ancient town of Harran, and when a rebellion breaks out in Syria in 746, he burns down the walls of Hims and Damascus. Grandson of Marwan I. Governor of Syria. The Abbasids were the second of the two great Sunni dynasties to rule the Islamic empire. The Abbasid caliphs officially based their claim to the caliphate on their descent from Abbas ibn Abd al-Muttalib (AD 566-652), one of the youngest (non-ruling) uncles of the prophet Muhammad, by virtue of which descent they regarded themselves as the rightful heirs of the prophet as opposed to the Umayyads. The latter were descended from Umayya, and were a separate clan from that of Muhammad's in the Quraish tribe. Following the overthrow and massacre of the Umayyads, the Abbasids never managed to assert their authority in Islamic Iberia, but they did install loyal governors in Egypt and Syria. They also put themselves forwards as representatives of the Hashemites, the clan which had previously lost out in the rivalry with the Umayyads for the caliphate. The capital of the Abbasid caliphate was in Baghdad, and the equality of all Moslems was established at the same time as they took control. Despite its bright beginning, the dynasty slowly became eclipsed by the rise to power of the Turkish army that it had itself created, the Mamelukes. Conquered the caliphate and founded the Abbasids. The Battle of Talas. The T'ang Dynasty Chinese are defeated, but no further advance into Central Asia is made. Saleh ibn Ali ibn Abdullah, wali of Egypt, is the uncle of the previous caliph, Abdullah as Saffah. Saleh's brother, Abdallah, launches a revolt in Syria against the new caliph, claiming that he himself is the rightful successor. Saleh refuses to join his brother's revolt. Instead he enters Syria to help suppress it, defeating Abdallah's governor of Palestine, al-Hakam ibn Da'ban. Abdallah is also defeated and is forced to submit to the new caliph. The last-known serious attack by the Islamic empire on Alania takes place. An Arab general captures and holds the Gate of the Alani, although for how long is unknown. Not permanently, it seems. Musa al Hadi succeeds his father as the caliph and relieves Al-Fadl ibn Saleh ibn Ali al-Abbassi of his position as governor of Egypt. Former wali of Syria (783-786). The Idrasids flee from the caliph and take control of Morocco. The Aghlabid amirs of Tunisia and Algeria assume autonomous rule with Harun's recognition of the fact. Defeated by Tahir ibn al-Hussein for al Ma'mun. Half-brother to his successor, al Mu'tasim. The eastern province which includes Persia and Khorasan has lost Transoxiana to the Samanids, so Caliph al-Mamun appoints Tahir ibn al-Hussein, the successful commander of the campaign which had defeated the caliph's main rival (al Amin), as the new governor, beginning the Tahirid period of rule in the east. Tahir effectively declares independence in his new domains by failing to mention the caliph during a sermon at Friday prayers in 822. At around the same time the island of Cyprus is taken from the Byzantine empire. Following the revolt by Euphemius, commander of the Byzantine fleet of Sicily, and his invasion of the island alongside Emir Ziyadat Allah I of Tunis, a large Byzantine force is sent from Palermo against them. This is assisted by a fleet from Venice under the personal command of the doge, Giustiniano Partecipazio, but it is defeated. Sicily is in the hands of the Arabs as part of the Islamic empire. The Turkic general, Afshin, puts down a joint Arabic-Coptic rebellion in Egypt, and the Arabic families there lose power for good. Suddenly Egypt and its governors are able to experience a semblance of stability. Caliph Ma'mun follows up on a recent minor success against the Byzantine empire by capturing the strategically important fortress of Loulon. A large army is collected together with the intent of conquering Anatolia piecemeal. 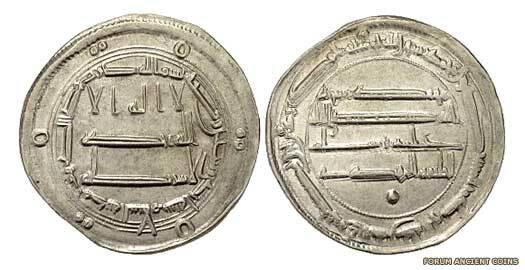 The caliph's general, al-Abbas ibn al-Ma'mun, wali of Syria, marches into Byzantine territory on 25 May 833, creating a military base at Tyana. The caliph's main force follows in July, just as the caliph himself becomes ill and dies unexpectedly. The invasion is abandoned. Former wali of Syria. Moved to Samarra with Turkic guard. Venice claims victory against the empire at Lussino. After serving a term of office as wali of Egypt, Ali ibn Yahia al-Armani, 'the Armenian', is given command of the caliphate's border in Cilicia, facing the Byzantine empire. He is the first emir of Tarsus known to exercise near-independent authority, as the Abbasid caliphate declines in authority. He briefly returns to office in Egypt in 849. Boḡā, one of the caliph's generals, invades Transcaucasia and the northern Caucasus, devastating Georgia, Abasgia, the Alan country, and the Khazar lands. The Alani soon recover however, and restore their state. The Saffarid emirs oust the Tahirids in Khorasan in 867, while Venice defeats the empire at Taranto. Suddenly the Islamic empire is looking a little shaky, and to cap its problems, in the following year the Tulunids secure the independent control of Egypt. The Shia line of divinely-ordained supreme religious rulers, who are all related by blood to the Prophet, dies out. Abbasid troops are sent against the Tulunids in Egypt because the ruling emir has failed to send enough tribute to Baghdad. Defeating them, the following year the emir invades and captures Palestine and Syria. Benefiting from a well-trained army, a stable economy, and an efficient bureaucracy, the Tulunids are able to achieve further military gains, including the capture of areas of northern Iraq. Saffarid Emir Tahir gains Fars in 901 and the city is held by his general, Ali, until Tahir is formally granted its governorship in 903 by Caliph Ali Muktafi. By 905, Ali is still in command of Fars and is showing signs of independence. He cuts off the flow of revenue from Fars and Kirman to Tahir. Tahir's lack of finance eventually tells against him when his uncle's patience with him runs out. The Tulunid emirs of Egypt are weakened by this stage following years of mismanagement of the country. The botched invasion of the Abbasid caliphate by Harun has triggered a response. Egypt is invaded and the new emir, Shayban, retreats to Fustat where he surrenders on 10 January 905. The Tulunid dynasty of governors and semi-independent rulers is ended and loyal and obedient Abbasid governors are installed. Held office for one day. The new Saffarid emir deals with the rebellious Ali in Fars by capturing the city. Ali appeals to the caliph and is aided in recovering Fars. Then he continues the fight against Emir Laith, capturing him in 910. Laith is sent to Baghdad as a prisoner while Ali is confirmed as governor of Fars. The Shiite (Sevener) Caliphate is established in Fatamid North Africa to rival the Orthodox Abbasid Caliphate. The governance of Egypt is passed to the Mamelukes, who rule with a certain level of independence, while in Baghdad the title amir al-umara (commander of the commanders) is created, and is taken by the real political power, the chief of the Turkic soldiers. The caliphate, including western Persia, falls under the Shi'ite Buwayid emirs of Iraq. Cyprus is lost to the Byzantine empire in 965, and Antioch in Syria in 969, while the Fatimids of North Africa seize Mameluke Egypt in the same year. Venice achieves victory over the Islamic empire at Bari. Gonario of Torres is the earliest-known of the giudici of Arborea, emerging at a time when an Islamic invasion of southern sections of the island of Sardinia takes place. It is possible that Cagliari is conquered briefly by this invasion, but little detail is known. Abdullah Ibn Yasin leads an army of nomads towards the major trading city of Sijilmasa in Morocco, immediately to the south of the Atlas Mountains in western Africa. The city contains 50,000 people and occupies one of the biggest oases in Africa, and it falls to this new army. Immediately, ibn Yasin leads his forces south around the edge of the Sahara to captures the source of Sijilmasa's wealth in gold at Awdaghust. Now they have a virtual monopoly in the Sahara region of this most lucrative trade. Ibn Yasin's followers gain the name 'Almoravids' from a phrase meaning 'Those bound together in the cause of God'. By this time, 1055, the caliph is under Seljuq control after the Buwayid amirs are defeated and Baghdad falls to these new Turkic arrivals. The caliph grants title of sultan to the Seljuq ruler, although in reality he has no choice in the matter. Pope Urban II proclaims the First Crusade to reclaim sacred Christian sites from Islamic hands. Starting from 1096, the First Crusade ventures into what it calls Outremer, defeating the Seljuqs, and capturing Jerusalem, along with large swathes of Islamic territory. The Crusader states of Edessa, Antioch, and Tripoli are created, while the local Muslim rulers all end their internecine squabbles and return home to defend their own domains rather than uniting to face the common enemy. The new governor of Egypt is Salah al-Din, who quickly becomes the main opponent of the Crusaders in Jerusalem. The Fatamid caliph dies, leaving Egypt in the control of Saladin, under the suzerainty of Mahmud Nur ad-Din of Damascus. The latter's death in 1174 allows Saladin to assert his full control over Egypt, becoming the first Ayyubid sultan there. Saladin leaves Egypt to fight the Crusaders in Syria, never to return to the seat of his authority. The following year he conquers Damascus and Aleppo from Sinjar, although it appears that Sinjar itself retains some level of independent local rule. The caliphate gains independence from the Seljuqs. Killed by Il-Khan Mongol Khan Hulagu. Despite being nominally dominated by the Mongols under the Great Khan Mongke, the actions in Syria and against Egypt that are being undertaken by Sultan an Nasir II Yusuf of Damascus force a Mongol invasion of Mesopotamia. Mongke decides to conquer the region as far as the Nile and sends a vast Il-Khan Mongol force against Baghdad in 1258. The caliph and his family are massacred when Yusuf fails to produce an army to defend them. It is said that 800,000 of Baghdad's inhabitants are killed, including the caliph - who is executed by being kicked to death. The death of Abdullah al Musta'sim signals the end of the Abbasid caliphate in a region that is clearly too dangerous, thanks to the ever present threat of further Mongol attacks. After this date (656 AH in the Islamic calender) no Abbasid caliph ever again resides in Baghdad, the city that has been associated for five centuries with the dynasty. Instead, the Mamelukes set up the Abbasid puppet caliphate in Egypt using surviving family members of the caliph, which continues until the Ottoman conquest. Control of the Islamic empire (along with the title of caliph) eventually falls to the Ottoman Turks, who govern from Asia Minor.